Peter Bernhardt, author of The Stasi File and its sequel, Kiss of the Shaman's Daughter, shares new perspectives on the craft of writing, gained from translating his first novel for a German edition: Die Stasi-Akte: Oper und Spionage: Eine tödliche Kombination. While you enjoy his guest blog, consider ways to apply it to your writing. "Four years had passed since I published my first novel, The Stasi File, when I finally gave in to what had been niggling at me: the desire to translate the book into German. After all, it deals with one of the most monumental events in German history—something most post-WWII Germans never expected to see realized during their lifetime—the unification of the two German states. Add to that the evil machinations of the most hated and feared institution in the former communist East Germany—the Stasi, which took the Gestapo methods of surveillance, coercion, and torture to new levels—and German readers who had suffered under the totalitarian regime, or who had relatives who did, would surely take notice. "However, it was not until after I had published the sequel, Kiss of the Shaman’s Daughter, and had written close to a third of my third novel, that I turned my attention to publishing a German edition. "At first I considered translating the novel myself, but after delving into the first chapter, I had to admit that having departed Germany at age twenty-three and having lived in the United States for forty-six years, my German was out of date. So I engaged a translator and an editor who were up-to-date. I was fortunate in working with a great team. Edith Parzefall from Nürnberg translated, and Berliner Kathrin Brückmann edited. 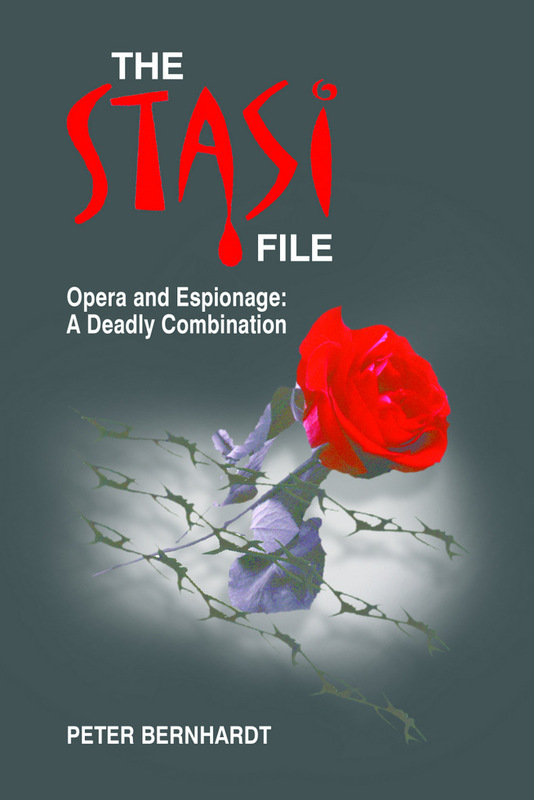 While my primary motivation was to make the novel available to German readers, I certainly won’t object should I reap financial rewards from Die Stasi-Ake. "At first blush, translating a novel does not seem to have any relevance to the author of an English language manuscript. However, a closer look will reveal a connection, meaning there are tangible benefits to revisiting a manuscript penned some time ago. "One could certainly despair when seeing the flaws in one’s early work. However, I choose to see the positive, which is how much I have learned since writing my first novel. "You obviously need not translate your work to appreciate how much you have grown as an author. Simply study something you wrote a while back and you will discover what I did. That is, the sheer number of filters that are present in one’s first attempt at writing fiction. Then having gained experience, one is able to express in a succinct phrase what previously took several sentences to convey. The list goes on: tag lines that are not needed to identify the speaker; dialogue that can be tightened, made sharper, reveal more character, advance the plot better, and is not mundane; bringing descriptions to life by having the characters interact with their environment; getting rid of over-explanations that deprive the reader of the greatest reading pleasure that comes from engaging one’s imagination. "These are just a few of the endless examples of how much an author can gain from reexamining a novel. I’m not suggesting that we must wait years like I did, but simply that letting a manuscript sit for a few weeks or months before giving it one final read-through will make the novel infinitely better, i.e., more polished. "I have put my experience into practice by taking advantage of the ever existing opportunity to revise my novels printed on demand. "While readers of my books as initially published have not pointed out any shortcomings in the writing, I do feel it’s important for me as the author to make it as perfect as possible, even if I’m the only one who is aware how something could be phrased better. As I’m halfway through penning my third novel, I’m ever mindful of the lessons I have learned during the translation process. The Stasi File and Kiss of the Shaman’s Daughter, polished to the best of my ability, are available in paperback and Kindle format on Amazon. For reviews, reader comments and list of awards please check Amazon as well as my website. Happy reading, writing and editing. Edith Parzefal, author of Snow White’s Slide and Schneerutschchen! Both editions are available as ebooks and paperbacks. If you're undecided between Indie and traditional publishing, and how each affects income at The Business Rush , the June 13, 2012 article, "Hurry Up. Wait", by Kristine Kathryn Rusch explains important differences between Indie and Traditional publishing, including detailed accounts of how and when authors should expect their book(s) to return any profit. Writers often need facts about time zones, calendars, special days, moon phases and other data and here Time and Date is a website that provides many of them. Small screens mean more interest, more sales, or so said the article, "Good Fit for Today's Little Screens: Short Stories," by Leslie Kaufman, in the New York Times. Stymied about how to write a book proposal for your non-fiction book? Check Publishers' websites. Most of them (particularly those that take unagented submissions) have a "For Authors" or "Submissions" link that will give details of what that publisher expects in a proposal, and you'll see various formats different publishers expect. Good luck! Let readers know about your success by leaving a comment on this post. You're finally ready to think about getting an agent. Whether you've received recommendations, met one or more agents at writer's conference, or are completely clueless, as I was before I earned the title of "author" there are things you should know. Author Link is an excellent website where you can learn a great deal about the publishing industry, and you'll find a link to literary agents under Author Resources. Each listed agent supplies detailed information about their services, free. Writers researching for an agent for the first time won't go wrong by checking to learn if the agent they're considering is a member of the Association of Authors's Representatives . Membership means the agent is aware of a professional code of ethics. However, non-membership certainly doesn't imply an agent isn't ethical, dedicated to their clients, and perfectly suitable in every other way. Excellent information about writing your book proposal is provided by Rachel Toor. She is an associate professor of creative writing at Eastern Washington University's writing program in Spokane. The Reality of Writing a Good Book Proposal, and the sequel, How to Write a Good Book Proposal, the Sequel, by Rachel Toor. Her Web site is http://www.racheltoor.com. She welcomes comments and questions directed to careers@chronicle.com. It's always a thrill to find your book referenced by a writer, and doubly so when it's in prestigious media, such as the instance below. On August 22, 1883, the Northern Pacific Railroad (NPRR) drove the last spike to complete transcontinental mainline at Independence Creek, Montana Territory, which lay about 50 miles west of Helena, Montana and about 30 miles west of the Continental Divide. Two hundred plus years later, in 2012, "Verily the Road was Built With Chinbaman's Bones: An Archaeology of Chinese Line Camps in Montana", by Christopher W. Merritt, Gary Weisz, and Kelly J. Dixon, explores facts about the Chinese labor employed in the construction of the NPRR, and draws conclusions about the impact of those unheralded workers on the future of our country. "This was really a great collaborative effort, as Gary Weisz (retired from the railroad and a true citizen historian/archaeologist) had all the site information and was able to provide such a great wealth of knowledge, and Dr. Dixon and I worked up the archaeology context and history. Gary made sure we kept on track with our historical overview!" Dr. Merritt said. "Construction of the transcontinentals required massive numbers of laborers who lived in temporary "line camps" along the railroad grades. A sample of spatially and ethnically segregated Chinese line camps along the transcontinental Northern Pacific Railroad in the Rocky Mountains of north-western Montana provide historical and archaeological examples of the Gilded Age's pervasive racist mistreatment of the Chinese, culminating in Chinese exclusion laws." Dr. Kelly J. Dixon is an archaeologist and Associate Professor of Anthropology at University of Montana Department of Anthropology. She specializes in archaeologies of the American West, with her published research representing case studies from the past several centuries. Her research interests are integrated with undergraduate and graduate student projects and include archaeologies of adaptation, colonization, colonialism, global change, landscapes, landscape transformations, human-environment interactions, boomtowns, extractive industries, marginalized populations, and text-aided approaches to archaeology. Dr. Merritt also was teaching at the University of Montana Department of Anthropology at the time, but has since taken other employment. An article of this scope required considerable research, dedication and planning. Gary Weisz's background equipped him with specialized and unique knowledge that suited the task perfectly. 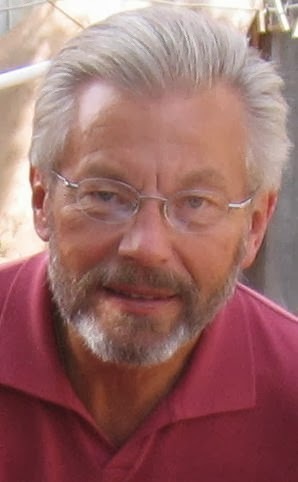 Beginning in 1967, he worked for the Northern Pacific Railroad (Signal Department) from Paradise Montana to Sandpoint, Idaho, and quit working for the Burlington Northern in 1977, and afterwards worked various jobs until he retired. "I worked with Art and Lyle Younker. In 1967, while headquartered in Thompson Falls, a couple of older railroad employees pointed out several Chinese camps occupied in 1882-1883. I visited the Thompson River camp at that time and later began locating additional camps and documenting and researching the artifacts left behind," Weisz said. "I guess you could describe me as an avocational archaeologist and historian who takes his hobby very seriously. Throughout the years, numerous professional archaeologists have generously shared their expertise with me and provided guidance as my research progressed. A number of Universities have graciously provided professional papers and reports for my research library. This has been an ongoing learning experience for me and acceptance into the archaeological community has been very gratifying," he said. Weisz also does archaeological research on the Kalispell Indians, Coeur d' Alene Indians, and fur trade era artifacts from this area. Weisz was born in Sandpoint, Idaho, where he still lives. He and Archaeologist James C. Bard PhD., Senior Principal Investigator at SWCA Environmental Consultants, Portland, Oregon, will be presenting "Weaving the Threads: A View of the Overseas Chinese in Northern Idaho" This paper will be presented at the "Chinese Railroad Workers in North America Project-Archaeology Workshop" to be held at Stanford University October 10th through October 12th, 2013. Various papers by individuals will be presented during the course of the workshop. "I am pleased with that!," Weisz said. I learned of their article while searching my name on www.dogpile.com, because my books, "Behind These Mountains, Vols. I, II & III" are referenced in "Verily the Road was Built With Chinbaman's Bones: An Archaeology of Chinese Line Camps in Montana". "Does The Status of Press Matter?" For those in graduate school with the job market and tenure in mind, when seeking to create a scholarly reputation the importance of the status of the press which publishes their first book cannot be overstated, according to Karen, creator of The Professor Is In blog, and former tenured professor at two institutions--University of Oregon and University of Illinois at Urbana Champaign. On her website early this year, The Creative Penn, Joanna Penn wrote a great article that explains "Why And How To Use MultiMedia To Enhance Your Ebooks." When I learned how this amazing mother helped her two young children publish a delightful book they'd written and illustrated I invited her to write a guest blog to share their inspiriting story. "This summer I helped my children get published," by Rasana Atreya. Since I’m a published author myself, it is quite common for us to do story telling/writing related activities. On a long car ride we might try a story-building exercise. The key is to make it sound like FUN. We start off with a random sentence, the wackier the better. Something like, ‘the rat got into the autorickshaw’ (open three-wheeler Indian taxi.) The second person builds the story by adding just one line to it. The line has to be connected to what came before, and it has to move the story forward. Each person gets a turn, then we circle back to the first person. The kids have learned to mine for lines that get them the most laughs. This has helped them in creative writing at school, as well. Given a prompt, they know how to take a story forward creatively. My daughter’s journey to being a published author started when we were on a long train ride from Hyderabad to Chennai, India. 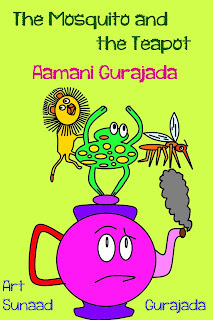 Aamani, then six-years old, was done reading her books. Since I limit the amount of time my kids can play electronic games, she was bored. Almost three years down the road my daughter decided it wasn’t fair that I was published, and she was not. So I decided to help them get published on Amazon. My eleven year-old wanted a shot at illustration so I downloaded paint.net and showed him the tutorials. Not only did he do the illustrations, but also designed the cover for the ebook. 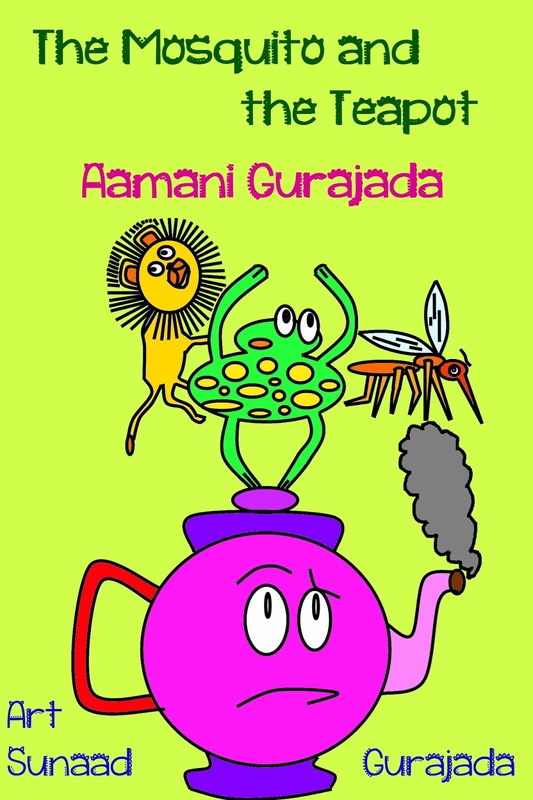 "The Mosquito and the Teapot" by Aamani Gurajada is an astonishing short book written and illustrated by two very young and very talented artists. The stories are short pieces in which usually two or three people, animals or things meet and resolve the conflicts between them. The simplicity of their form is disarming and there is a potentially very wise head behind the writing. The illustrations however are not second to the writing but a clear equal. I was amazed at their beauty and professionalism, not at all what I had expected from a young illustrator. They are simple, full of character and masterly executed." "Absolutely charming and appropriate. Tell him to keep going!" Our writing-illustrating-publishing experience has been a heady one. My daughter is tickled that she might possibly be the youngest author ever. And it has helped build my son’s confidence. After all, he’s now a professional illustrator. If you’re looking to help your child self-publish, you might want to check out my blog post: FAQ. Rasana Atreya is the author of Tell a Thousand Lies . Her novel was shortlisted for the 2012 Tibor Jones South Asia prize. "My daughter wrote seven stories, under 500 words total. My eleven year old illustrated the book, including the cover. I downloaded paint.net for my son. I then pointed him to the YouTube tutorials. He drew up the cover and did the illustrations." Congratulations to Edith Parzefall! Her book, "Strays of Rio" placed 3rd in the thriller category of Dan Poynter's 2013 Global Ebook Awards. Cinderfella Conspiracy , the sequel to Snow White's Slide is now available via at Amazon. When it arrived, Editor Trish Gannon's request to do an e-mail interview was a welcome response to a press release I e-mailed to several magazine and newspaper editors. The River Journal is one of my favorite publications, and therefore I knew her magazine taps into markets hard for me to attract, such as, environmental, literary, and ecology, to name a few. The Question &Answer interview resulted in "The Montana Scribbler has History at her Fingertips," in The River Journal's May 2012 issue -- a story about me and my current writing project. The River Journal hit the stands May 8th, and the online story, in full color, appeared on the Internet the next day. It's a classic example of, "What You See Ain't Always What You Get." The feature in The River Journal is a prime example of glorified advertising. Although not appearing to be the feature's focus -- paying tribute to an author who excels at the project she's currently passionate about -- the article links my website Behind These Mountains. Trish's introduction to the Q &A interview is so flattering, I blush from remembering her glowing words. However, the feature, while being most flattering to me, is a prime example of glorified advertisement -- terrific advertisement for my books AND Trish's magazine. Gannon is a smart publisher. She knows the publicity value of stories she publishes -- the Q & A interview about Behind These Mountains broadens her prospective audience by attracting history buffs, as well as readers of The North Palouse Washington e-Newscast. Articles published in that online newspaper are tapped into by readers worldwide. Authors have to keep broadening their "Platform." Whether they like taking the time away from writing or not, it's essential. On the other side of the equation, publishers also must continuously broaden their circulation. Always be respectful of the publisher who honors you, and reciprocate in everyway possible to help them achieve their circulation goals. Another facet of advertisement lies in images. "Image" is an important aspect of publicity, and in the publishing industry today, images can be crucial. Keep genre and topic in mind when selecting images. Don't be unduly misleading. The .jpg I supplied Trish to accompany the interview story was a picture taken during a fairly recent Christmas holiday. Gathered with our family, a grandson's girlfriend, who worked in the makeup\perfume department in an upscale department store, "did our makeup" for all us gals. Because it looks like a studio portrait, I knew the .jpg would reproduce well in both the print and online editions of the magazine because the background is uncluttered. The photograph portrays me as the professional I'm proud to be. However, there's truth in the old adage, "What you see ain't always what you get." My website profile has a more recent picture, taken during another role I enjoy equally -- being a contented great-grandma. It's a Win-win for both of us! Who gets your intellectual property -- books, manuscripts, copyrights, etc., when you die? Find Law provides more information, and free legal forms. VAGABONDS: Anthology of the Mad Ones is calling for submissions , due by August 16, 2013 for their September 26t, 2013 anthology. Vagabonds publishes Poetry, Photography, Playwrights and Film Scripts, Short Stories, Excerpts from Travel Diaries, Digital Artwork. For a simple, very inexpensive web presence both Google Blogger (http://tinyurl.com/2wlwv3) and WordPress will purchase a domain for you, and host the site and allow you to use the blogging tools to maintain the site. Create your Google Blog and then domain hosting costs $10 per year, using GoDaddy.com. Your URL drops "blog." ie: www.montanascribbler.blog became www.montanascribbler.com. WordPress.org has a similar deal. Create your website with WordPress, and then have it hosted with a company like Bluehost.com. For hosting your website, Domain.com is a bit more expensive, like, say, $15 bucks compared to $10. WordPress software is far more sophisticated than Google, with uncountable widgets that allow a person to tailor the site. BetterWebSpace (https://www.betterwebspace.com) is a UK company, but they have servers both in the UK and US. They are inexpensive - hosting on US servers costs about $23 a year. The only extra they charge for is backups and their support is superb. Weebly.com (www.weebly.com) is a completely free option, where you can point your domain to it. Thehe design is done by a GUI that's easy to use. It's possible to setup an entire site in about half an hour, no cost, using your own graphics and one of their built in themes. Really, really good for a light-weight web presence. If you want a fully functional group interaction kind of thing, try out Groupspaces.com (www.groupspaces.com.) Not quite as pretty and customizable as weebly, but very, very functional. Mailing list, forum, news feed, event RSVP, file vault, photo album, and a 'website' front where you can put up a description and allow people to join. Both are free, and great for getting on your feet as either an independent web presence or an entire group. Other sites like Pinterest.com (www.pinterest.com) can also act as a sort of billboard website, and Deviantart.com (www.deviantart.com) and Hitrecord.com (www.hitrecord.com) that allow you to show off individual works. Jenn Allen, whose passion is writing but now works in healthcare IT, shares what she learned from more than a decade in the IT industry. Jenn wrote, "IT puts food on the table. My education was from Internet Service Providers (ISP) big and small. I worked for several ISPs during my career and have worked on DNS and website implementation for many customers (as well as my own). Domain Name System is the Internet system used to translate names into IP addresses. "I've watched the DNS sub-industry transform from a monopoly held by Network Solutions. In those early days, it was closer to $100 than $10 to register a domain and there were few extra hoops to the diverse jungle of registrars and super-cheap registration service bundles it is today. "The biggest thing to watch out for, if I had to summarize it, would be that cheapness never comes cheap, Registrars offering insanely low deals most likely cut corners on domain services and ease of use after you get the domain, or they have so many customers that you're unlikely to get an audience should anything actually go wrong. "I used a particular DNS company (name withheld) for their balance between cheap and featured, until I heard of some of its business practices ~~ difficulty transferring domains, holding domains 'for ransom' after they expired - it costs more to get a domain re-registered if you let it lapse, or did when I looked into it. Then I switched to Domain.com, and completely love it. "It is a tiny bit more expensive (closer to $20 than $10), but I get all the features, less obnoxious ads, and I can also now point [my domain.com], instead of just [www.mydomain.com], which is a subtle, but important difference for someone who doesn't host a full web server in some colocation facility with static IPs. What process/fees are required hoops to transfer your domain to a different registrar? Do they provide free DNS? If so, do they point to the domain name, eg. register.com, or will they only point hostnames, eg. Register.com, www.register.com, to a third-party server? What do they do if you miss your expiration date? Do they hold your domain hostage for 6 months, and then sell it to a third party reseller, knowing it's wanted? What are the renewal fees? Any hidden fees for contact info updates, DNS updates, etc.? Remove *Fiction* from the title, because it can turn away those who are more interested in writing nonfiction. Published writers tell me it is the very best book for a writer, fiction or nonfiction, of any caliber or degree of experience/inexperience to IMPROVE their writing. It doesn't teach writing. It teaches editing. Update on successes of co-authoring, Perks and Pitfalls of Writing With a Co-Author, the previous guest blog by Edith Parzefall ~~ Long Doom Calling, the fourth book in the Higher Ground series, which Edith co-wrote with Francene Stanley is published and the ebook is available from amazon stores and should soon appear for Nook, Kobo, etc. The paperback edition will take a little longer. Their second book in the Higher Ground Series, Knights in Dark Leather, was released in October 2012, and Golden Submarine, the third book, released later. Edith co-wrote the series with Francene Stanley. Read excerpts at Double Dragon Publishing. was published in November last year by Solstice Publishing. This is the first book in her Moonstone series. Solstice Publishing just released Stanley's novel, Tidal Surge, the second in the Moonstone Series. Their books are available at Amazon. Nel Duvall ~~ aka Mel Duvall ~~ guest post at Terry's Place points to a mistake many writers make: Not learning, or using, available tools, and she adds, "WORD has a great tool for editing in Track Changes. Check out the tutorial, http://continuinged.uml.edu/online/tutorial/word_trackingxp/. Last December when I wrote, "Angela Hoy provides thought-provoking advice about e-books and the reading public: Read, 75% of Americans DON'T Own Ebook Readers - Are you ignoring 75% of the book buying market?! on WritersWeekly ," I received a number of insightful thoughts that will give you something to consider for your own writing\marketing plans. Admittedly my observation of the market may be skewed, since I live in Amazon's home town. But since I started working in downtown Seattle a month ago, commuting daily by public transit, I have seen a LOT of people reading Kindles. And a lot of people reading tablets. And literally everyone seems to have a smartphone, and many of them are reading on them as well (including me on occasion). "I'm sure Angela has some points, but as someone else pointed out the 75% who don't own an e-reader includes a lot who don't read at all. This suggests that only about 60% of the population is likely to do any significant amount of reading, and if all of those with e-readers are in that 60%, about 40% of readers have access to e-books. Angela's anecdote about her Dad, who reads, but not e-books, is just one person. I can supply a counter to that: my own reading habits. I'm several years older than Angela's Dad, but not retired and with no significant health issues. Since June I have been keeping a log of the books I've read. In that time I have read 21 books, all except three of them novels, mostly from the 19th century, though including three first published within the last five years. This has been a total of over 6,000 pages of reading. Only four of these books were actual paper books. All the others I read on my Nook. I am currently reading three books, two paper and one electronic. On the other hand, I have also read nearly two hundred newspapers and perhaps twenty or thirty magazines in this time period, none of them electronically, and hundreds of websites, all of them electronically. So for books, about 80% of my reading is electronic. For other reading, perhaps 50%." "I have the sneaking suspicion that sales of ebooks vs. hard copies is twofold: 1) average age of your target market, and 2) the genre in which you write. Speaking for myself, I've learned the new technology and get a few books a year on my Nook. But I'll be more prone to certain genres if I do buy the e-version. Literary novels, for instance, just don't seem to fit the fast paced world of the ebook; I will definitely buy a hard copy. Same with historical or high fantasy novels - the length and depth of those books almost requires the ability to take your time, and a physical copy in your hands. 'Faster' genres, like sci-fi, romances, and especially YA are probably the overall better sellers in ebooks, I suspect. Younger people read them, and they are great formats and pace for the ebook. Just my two cents." "Thanks for posting this, Mona! Angela Hoy's dad andI live in the same world. He's the kind of reader I write for. Plus, thanks for yet another good site to follow." "But are the 75% also readers? My brother doesn't have a computer. Has no need for an ebook reader. The only thing he's read since high school has been the TV Guide and the horse race rags. He's irrelevant for any marketing strategy or any survey about e-readers. Maybe it's part genre; maybe it's part the age of the people surrounding you. As someone already said, us old farts are not necessarily interested in a new technology every year (or six months)." "Just talked to my sister who was given a Kindle last Christmas (by a granddaughter). "How's that thing working?" I ask. "Haven't used it yet," she says. And she's a smart woman who reads more books than I do (but not the same kind) So here's my theory, older people get tired of learning a new technology every other year. But I have been thinking of a tablet, or something along that line, since my eyes are steadily getting worse. I've checked e-readers in the stores and they don't do it for me, the screen is too small. Yes, you can increase the size of the font, but really, who wants to read 18 point type in a six by nine page (guessing here on page size)? mostly, though, the time and effort spent learning new technology seems better spent reading and writing. If you only publish by ebook, obviously you will not reach readers who do not own a device. You can cross them off." "E-readers don't cover the entire ebook market. A lot of teens and young adults are reading books on their smartphones, and I confess I do the same in a pinch. Lots of older people are reading from full-size tablet computers, and others use Kindle or other ereader applications to simply read from the computer. In addition, the growth of ebooks has been nothing short of volcanic. Ten years ago they held a tiny fraction of the market; today they are the fastest-growing segment. The 22% sales cited in the article is nothing short of incredible, when you look at how long they've really been round. Also, if you look at royalties, each ebook reader is worth more to an individual writer than a paper book reader, with the exception of readers who buy hardbacks. And ebook readers tend to buy more books because of the lower prices and ease of purchase. I would love to see a serious study done on this, dividing books into separate genres. My suspicion, especially as I watch bookstores change to reflect the market, is that increasingly physical book sales are in the children's market, and that adult book sales are moving more toward ebooks, with the biggest migration to ebooks being the young adult market. I agree that one should not discount the power of paper books, and I don't think they will ever go away, but they are diminishing in importance." "Initial sales of my first novel in soft cover through book parties to friends and acquaintances, giving presentations at book clubs, opera club, German-American Society, plus through a few retail outlet displays, folks I come in contact with (several physicians I've seen have purchased the book): about 200. All of my sales since then have been on Kindle, averaging between 10 to 20 a month without any promotion, except for one day in November of book of the day, which resulted in 150 Kindle sales. Total sales of ebooks since I put it on Kindle in September 2010: about 425. Plus there were about 1,400 free downloads when I put it on the KDP Select one day free promotion. Not sure what good the free download promotion did. This article notwithstanding, as far as I'm concerned, ebook sales is where it's at, not only as to number of sales but also as to royalty percentage. Still, to accommodate those readers of my first novel who still prefer paper, I will publish my second novel both on Kindle and as a soft cover through Create Space. As for old geezers not wanting to learn new technology - there ain't nothing to learn as far as how to use a Kindle unless you cant figure out how to plug it in and turn it on. Anyone that afraid of nothing is probably not the kind of reader I want to read my books anyway." 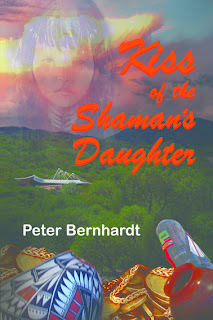 :-) Peter Bernhardt, Author: The Stasi File , Quarter Finalist 2011 Amazon Breakthrough Novel Award; Amazon Kindle, Sequel: Kiss of the Shaman's Daughter .